The latest update on Americans’ debt and credit developments from the Federal Reserve Bank of New York (FRBNY) showed that total U.S. household indebtedness was $12.73 trillion at the end of the first quarter of 2017, a $149 billion (1.2 percent) jump from Q4 2016 and the 11th quarterly increase in a row. 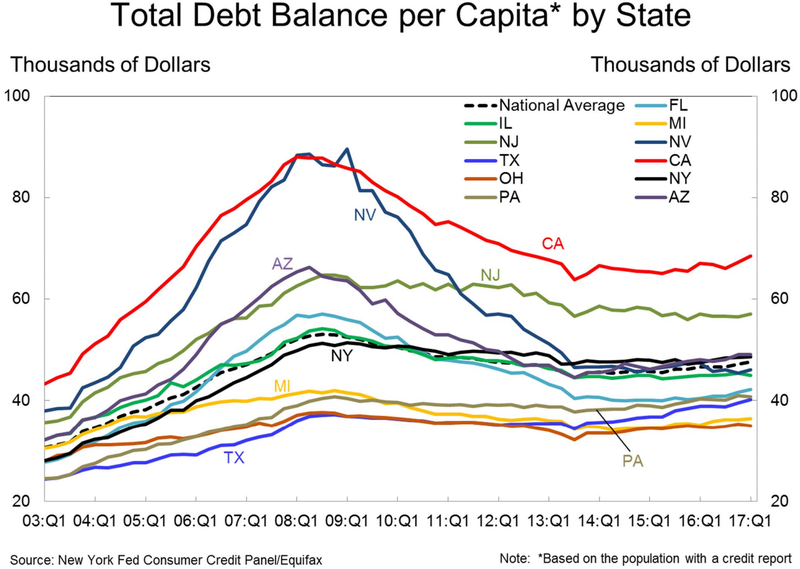 On the state level, California ended Q1 with the highest total debt balance per capita. Although the “Great Recession” officially ended in 2009, most Americans have stopped deleveraging only during the past few years. 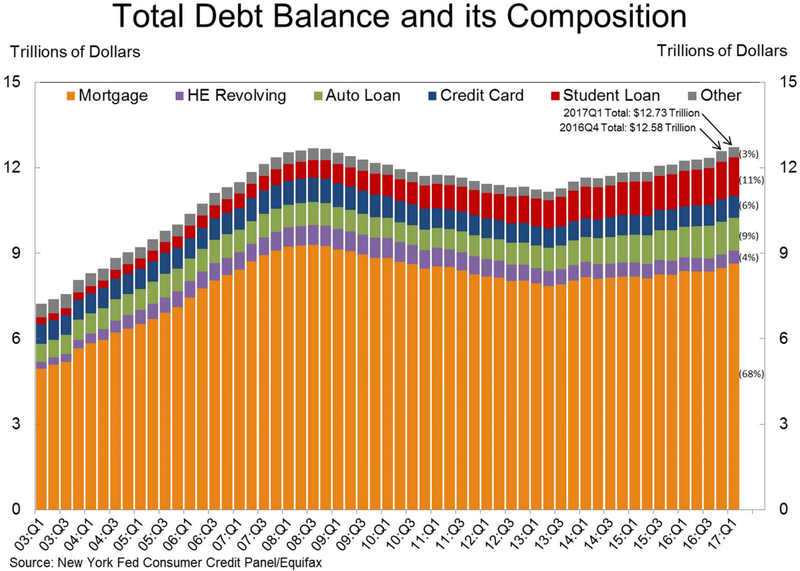 Still, the recent rebound has been considerable because overall household indebtedness has finally surpassed the 2008 peak of $12.68 trillion. 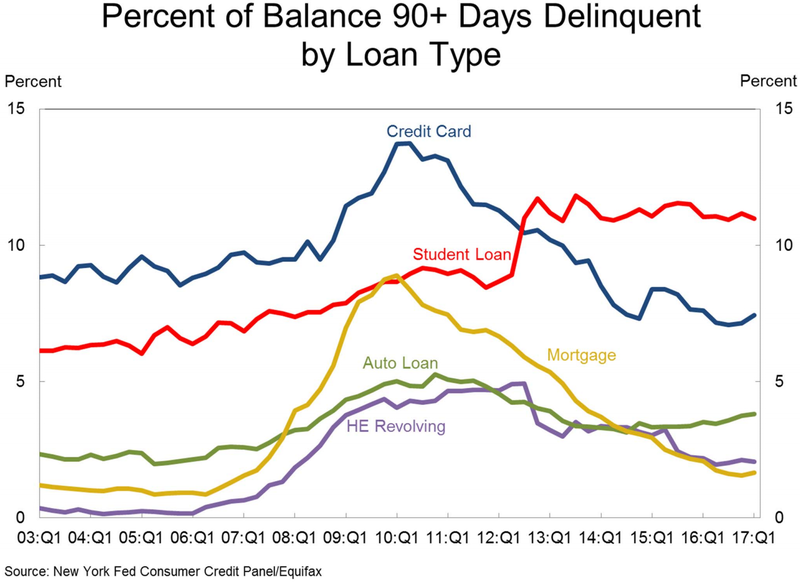 Rising mortgage, automobile, and student loan debt have all been big drivers of this uptrend but encouragingly only 4.8 percent of the total debt outstanding was in some stage of delinquency at the end of the first quarter, unchanged from Q4 2016 and therefore matching one of the lowest readings seen during the current economic cycle. 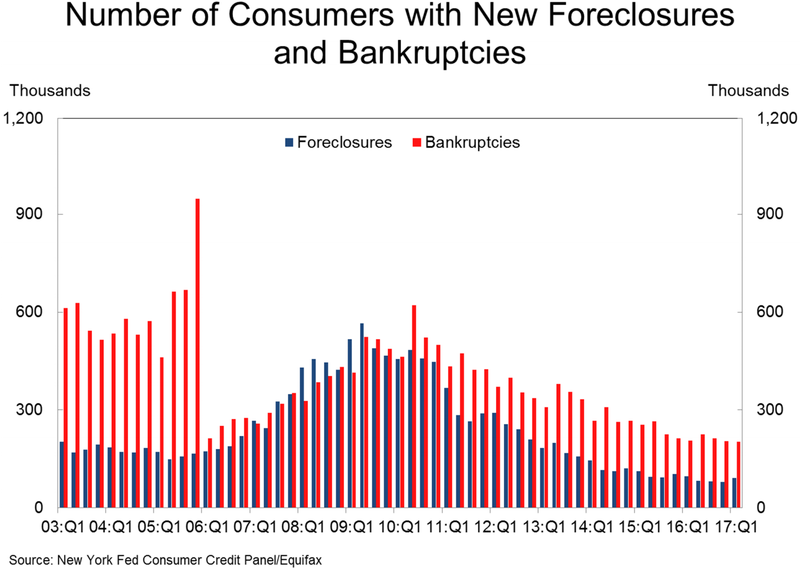 There were also 203,000 consumers that had a bankruptcy notation added to their credit reports last quarter, 1.7 percent fewer than in Q1 2016. 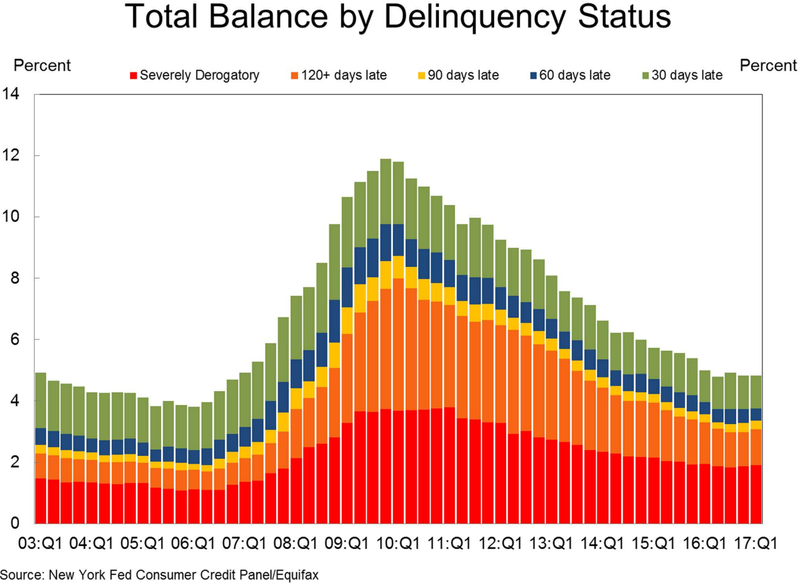 One thing to watch going forward, though, is the proportion of overall debt that becomes “newly delinquent.” This metric has generally been on a steady downward path during most of the recovery but in recent quarters appears to have possibly bottomed-out. 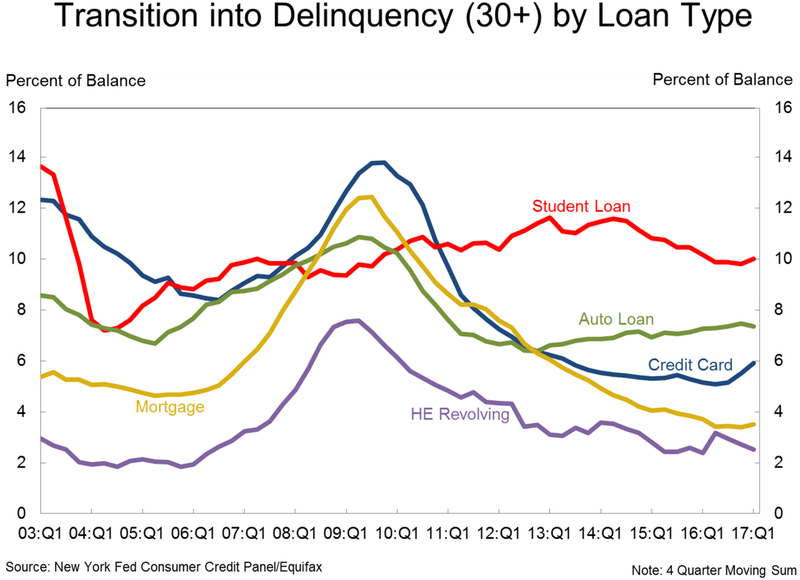 Car loans have been a major factor behind this trend shift, and the share of auto debt more than 90 days overdue rose to 3.8 percent in the first quarter, the highest reading in four years. 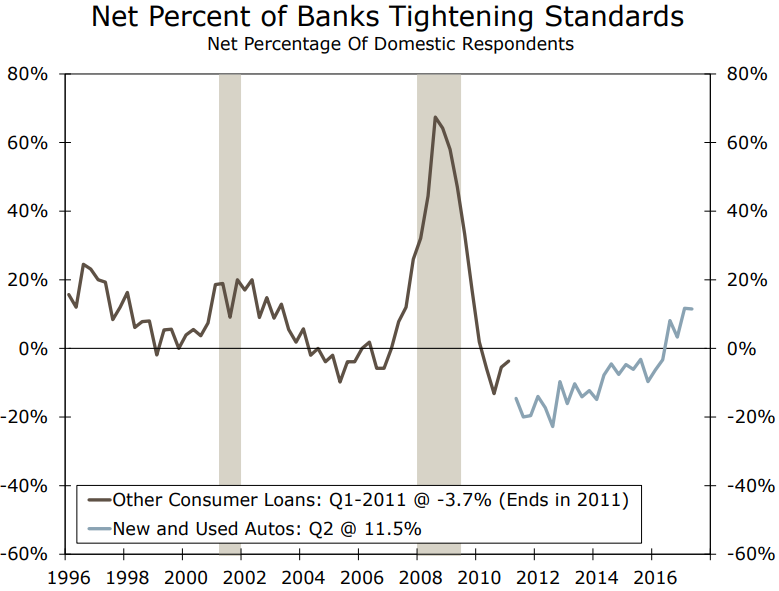 Unsurprisingly, a growing share of banks have reportedly tightened their lending standards for automobile loans in Q1, according to the latest Senior Loan Officer Opinion survey from the Federal Reserve, the fourth consecutive quarter of net tightening for car loans. Strategists at UBS even warned recently that the way lenders predict U.S. borrowers’ ability to repay automobile loans is flawed in ways similar to those that emerged during last decade’s housing bubble. 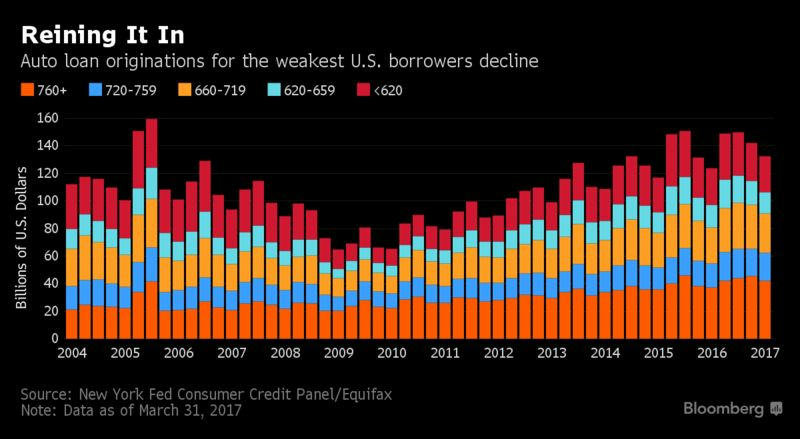 Despite the possible change in banks’ eagerness to lend, borrowing limits have now increased for seventeen consecutive quarters. 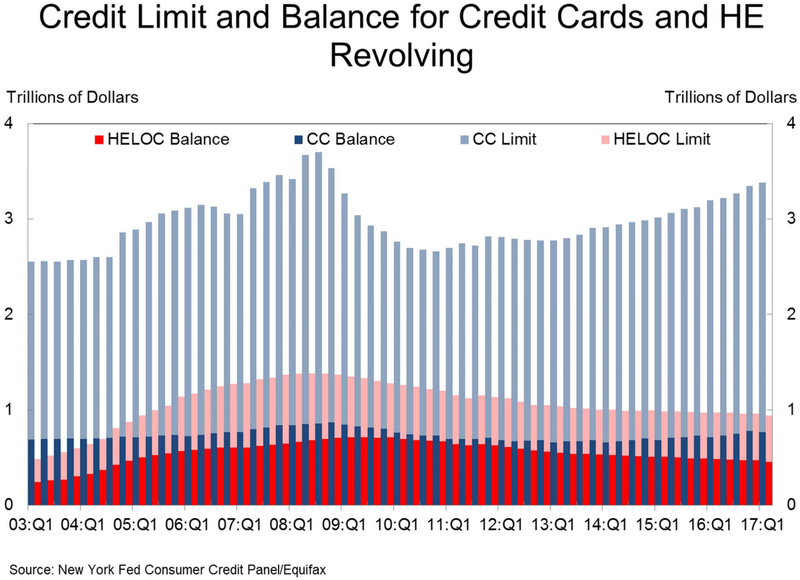 Moreover, the total number of credit card accounts in America continued to rise in Q1, and aggregate balances grew at one of the fastest rates of the expansion. Such activity can sometimes be an encouraging sign of consumers’ increased confidence in their personal finances, usually helped by a tightening labor market that is supportive of wage growth. On the other hand, Americans must be careful not to overdo it with their increased appetite for debt because a spike in leverage can often be a recessionary precursor. 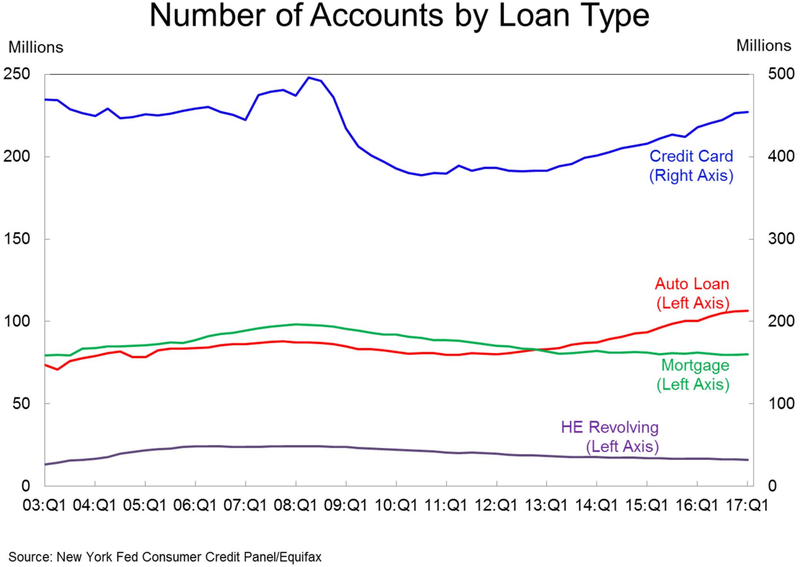 What is worse is that most borrowers likely anticipate that they will be able to eliminate all of their financial obligations in a reasonable timeframe but as we learned in an earlier report from the Financial Industry Regulatory Authority (FINRA), not even a quarter (23 percent) of surveyed retirees said that they are currently debt free. Perhaps an even better deterrent against excessive borrowing is a study by the Federal Reserve Bank of Atlanta (FRBA), which found that worsening creditworthiness and increases in severely delinquent debt lead to increases in individual mortality risk.